The embodied CO2e values for construction materials should be used to compare construction projects over their whole life cycle using the principles of BS EN 15978. In the UK, the average embodied CO2e impact of concrete is around 100kg CO2e per tonne. The value for different concrete products will differ and the use of GGBS or fly ash can significantly reduce the overall greenhouse gas emissions associated with the production of concrete. The latest CO2e values for a number of generic concrete products with and without reinforcement are given in the table below. A key contribution to the embodied CO2e impact of concrete comes from the cementitious content. Cementitious products comprise the glue that holds concrete together. These materials include traditional Portland cement and other cementitious materials, such as fly ash, ground granulated blast-furnace slag (ggbs), limestone fines and silica fume. These materials are either combined at the cement works (to produce a composite cement) or at the concrete producer when the concrete is mixed (the cementitious product is called a combination in this case). The values for these cementitious products and composite cements are given in Factsheet 18 published by MPA Cement. For more information visit the website for the Concrete Industry Sustainable Construction Strategy: www.sustainableconcrete.org.uk. The use of GGBS or fly ash in concrete, either as an addition or through a factory-made cement can significantly reduce the overall greenhouse gas emissions associated with the production of concrete. The reduction in overall greenhouse gas emissions can be as high as 40 per cent, depending on the concrete mix design and the application. 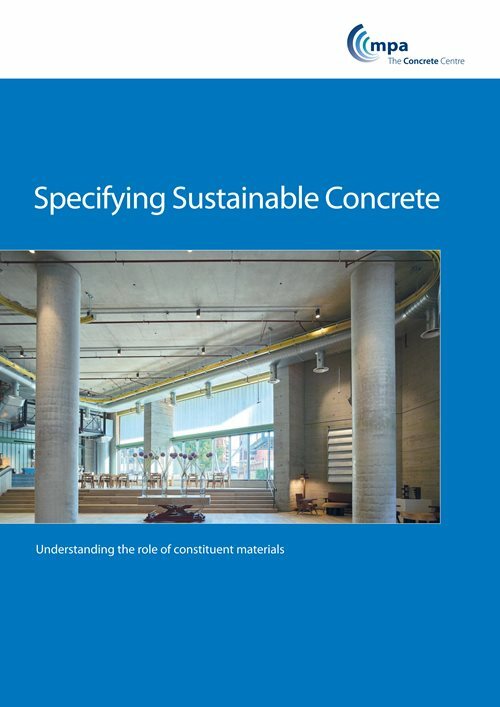 More information is available in The Concrete Centre guide Specifying Sustainable Concrete. The embodied CO2e of concrete compares favourably with both steel and timber when compared at the building level. Research carried out by Arup and commissioned by The Concrete Centre, focuses on three building types - commercial, hospital and school buildings - and compared the eCO2 impacts of different materials and structural frame solutions. Read more. More information is also available on the operational and embodied energy of offices and the operational and embodied energy of housing.